Remarkably, the local dailies pull a crisscross in their editorials today about Gov. 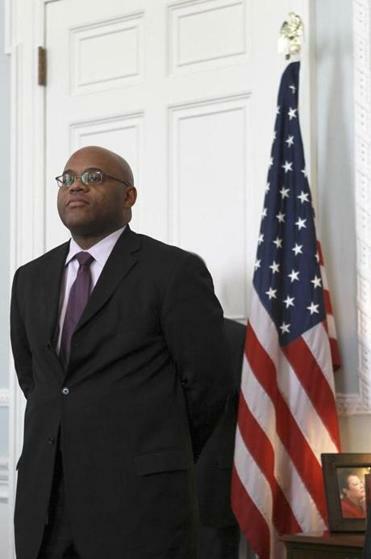 Deval Patrick’s appointment of his former chief of staff William “Mo” Cowan to fill the U.S. Senate seat just vacated by John Kerry (D-I Am Secretary of State Now) until the special election this summer. There is something to be said for bringing a little diversity to a body badly in need of same. But Cowan is also smart, energetic, a consummate professional and at age 43 really just at the start of a promising career that come summer will take him back to the private sector. He is also unflaggingly loyal to the governor he has served since 2009. Patrick won’t have to lose any sleep wondering what Cowan will do or say next. Which brings us to the best part — he’s not Barney Frank. IN CHOOSING an interim senator to serve for almost five months, a governor should have one overriding priority: Providing the best possible representation for the people of Massachusetts. The quality of that representation can be measured not only by the character of the person chosen, but by the amount of clout the appointee brings to a short tenure in the Senate. William “Mo” Cowan, Governor Patrick’s choice to fill the next four months of John Kerry’s term, has the requisite character, a solid knowledge of statewide issues, and has sounded the right notes of confidence and humility. But at 43, with only his stints as Patrick’s legal counsel and chief of staff as top-level credentials, Cowan counts as a surprising — and disappointing — choice. Simply put, Massachusetts is brimming over with political talent, including many potential picks of greater stature than Cowan, and many with vastly greater national experience. Namely, former Massachusetts governor and failed presidential candidate Michael Dukakis, Ted Kennedy widow Victoria Reggie Kennedy, and – wait for it – unemployed and unlamented former Congressman Barney Frank. The hardchoosing staff? We would have picked the Duke, who earned a Final Act with his block precinct work to get Deval elected in the first place. But, apparently, Cowan’s Mo-mentum trumped all that. Boston residents got a big helping of more of the same following last night’s State of the City address by Mayor-for-Life Thomas M. Menino. In a speech by turns sentimental and unabashedly bullish, Mayor Thomas M. Menino returned to the public stage Tuesday night after a lengthy illness and offered a buoyant vision of Boston, celebrating accom plishments and outlining initiatives for the future. Menino entered Faneuil Hall to thunderous applause from a crowd of 800 that included Governor Deval Patrick, members of Congress, and scores of other elected officials and dignitaries gathered for the mayor’s State of the City address. Waving to the audience, Menino — serenaded by a Kelly Clarkson pop anthem with the lyric, “What doesn’t kill you makes you stronger” — used a cane to help navigate the 50-foot walk to the stage. 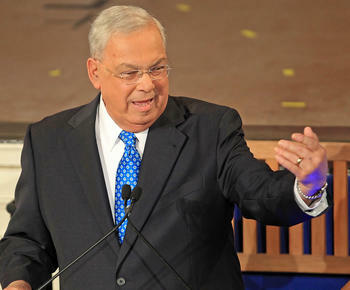 THE HIGHLIGHT of Mayor Menino’s State of the City speech wasn’t its admirable theme of enhancing human potential. It wasn’t in the genuinely impressive progress in city development, with 2,000 units of housing now under construction. And it wasn’t in Menino’s trademark medium-sized initiatives, like his networking plan for women-owned businesses. Rather, the highlight was Menino himself. 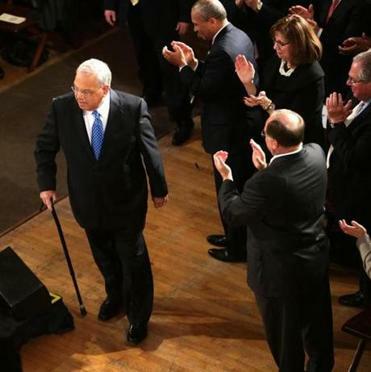 In his proud, steady walk to the podium, with only the help of a cane, Menino sent a strong signal that he is back of the job after nearly six weeks in the hospital for a range of ailments, followed by another month of rehab. The mutual affection between Menino and the city was visible in his interaction with the crowd, which whooped and applauded at even corny lines like a joke about Mitt Romney’s “binders full of women.” For his part, Menino offered his sincere thanks to all who helped him and stood by him during his rehabilitation. And he showed his graciousness in other ways, too, such as with a comradely tribute to retiring State Senator Jack Hart. Nowadays in Boston, all politics is cozy. Walk the walk & talk the talk? Yes, he can! In the end, it was the irrepressible Rev. Eugene Rivers who captured the most important 50-foot stroll of Thomas Michael Menino’s public life. 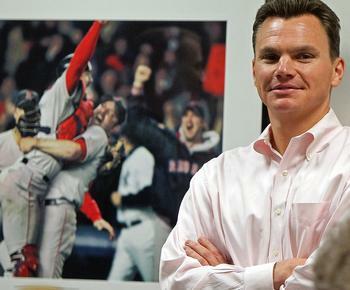 “That dude didn’t just walk into this hall tonight, you understand,” Rivers said, of the mayor’s unassisted entrance into Faneuil Hall, “Tommy, man, he gangsta-walked in here, you hear what I’m sayin’? Not to get technical about it, but Eugene Rivers is the Hub’s fraud di tutti fraudi. And the ultimate Menino toady. Any of you wanna piece of that? Sadly for dozens of presumably upstanding Maine residents called for the jury pool in the so-called “Zumba” prostitution trial, these are the kind of sexual questions they may be asked. Worse: A judge’s effort to keep the questioning private has been overturned by the state’s highest court. Bad news for the good townspeople of Kennebunk, excellent news for the Herald. No news, however, for the Boston Globe, which didn’t mention the trial in today’s edition. 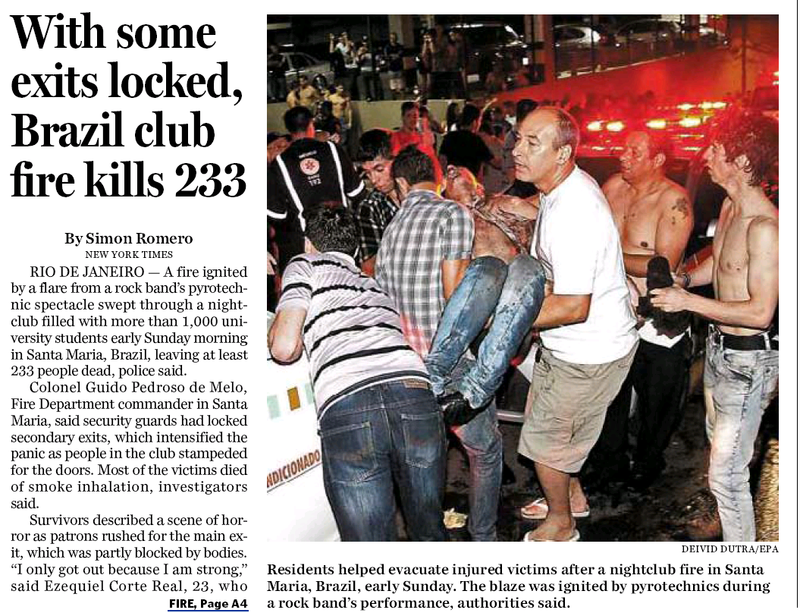 The broadsheet did post this Associated Press piece on the Globe website around 3:30 this morning. Two weeks ago, Gov. Deval Patrick proposed to raise over $2.5 billion in new taxes, including a 20 percent jump in the income tax — the largest in state history. Since then, most of the discussion has focused on the politics of such massive tax increases, and not on the economic implications of such a significant hike in the cost of government. The over-arching message seems to be that tax rates don’t matter, the size of government doesn’t matter, and the machine that is state government is already doing a perfectly fine job of maximizing the use of state tax dollars. All it needs to ramp up its performance — and the commonwealth’s along with it — is a lot more money. In short, the debate has already presumed that there is no economic development price — no “growth” price, to use the governor’s words — to be paid for such a huge increase in taxes — just a political one. Recent history would suggest otherwise. Unfortunately, there’s no link to the helpful chart on the Herald website (big surprise), so you might want to dig a print edition out of the recycling bin. Regardless, Baker’s piece comes hard on the heels of the hardreading staff’s noting his conspicuous absence from any speculation about potential candidates for the U.S. Senate seat John Kerry (D-Seriously, Am I Secretary of State Now?) will soon be vacating. 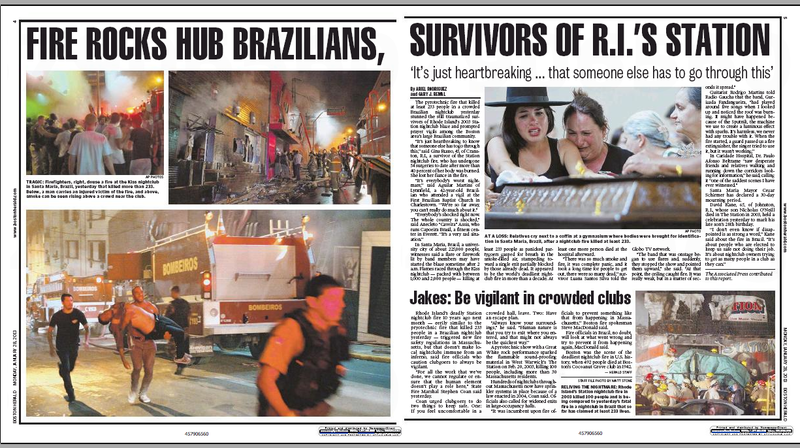 The nightclub fire that killed 233 people in Sao Paulo Santa Maria, Brazil, yesterday has, as many have pointed out, haunting similarities to The Station nightclub fire in Rhode Island a decade ago. Both Boston dailies noted the echoes in their print editions today, one much more vividly than the other. The Globe ran the story Page One, but it was a pickup from the New York Times. The disaster ranks among the deadliest nightclub fires in history, comparable to the 2003 blaze at The Station nightclub in Rhode Island that killed 100 people, one in 2004 in Buenos Aires in which 194 were killed, and a fire at a club in China in 2000 in which 309 people died. In 1942, a fire at the Cocoanut Grove nightclub in Boston killed 492 people . . . The scene recalled the 2003 fire at The Station nightclub in West Warwick, R.I., at which the rock band Great White was performing. During the show, pyrotechnics set fire to flammable soundproofing foam that lined the walls and ceiling, killing 100 and injuring 200. 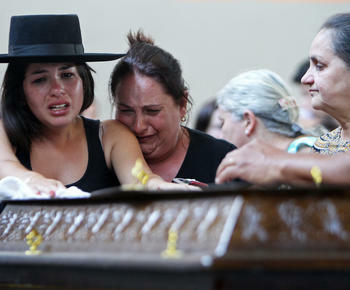 The pyrotechnic fire that killed at least 233 people in a crowded Brazilian nightclub yesterday stunned the still traumatized survivors of Rhode Island’s 2003 Station nightclub blaze and prompted prayer vigils among the Boston area’s large Brazilian community. “It’s just heartbreaking to know that someone else has to go through this,” said Gina Russo, 45, of Cranston, R.I., a survivor of the Station nightclub fire, who has undergone 54 surgeries to date after more than 40 percent of her body was burned. She lost her fiance in the fire. Except tell the stories as best you can. 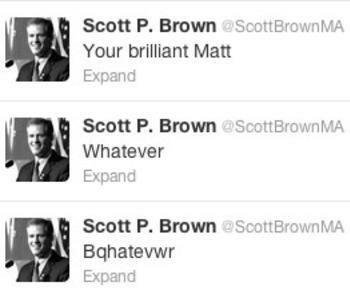 Former U.S. Sen. Scott Brown set off an Internet sensation early yesterday after a string of odd messages were posted on his Twitter account, including one that appeared to be a misspelling of “whatever,” that turned into a popular online trend. Twitter users soon used the nonsensical word in famous quotes and pop culture references as the term became a Twitter trend . . .
Compounding the problem: Brown later deleted the tweets. But that didn’t stop the waves of ridicule that subsequently washed over Brown. 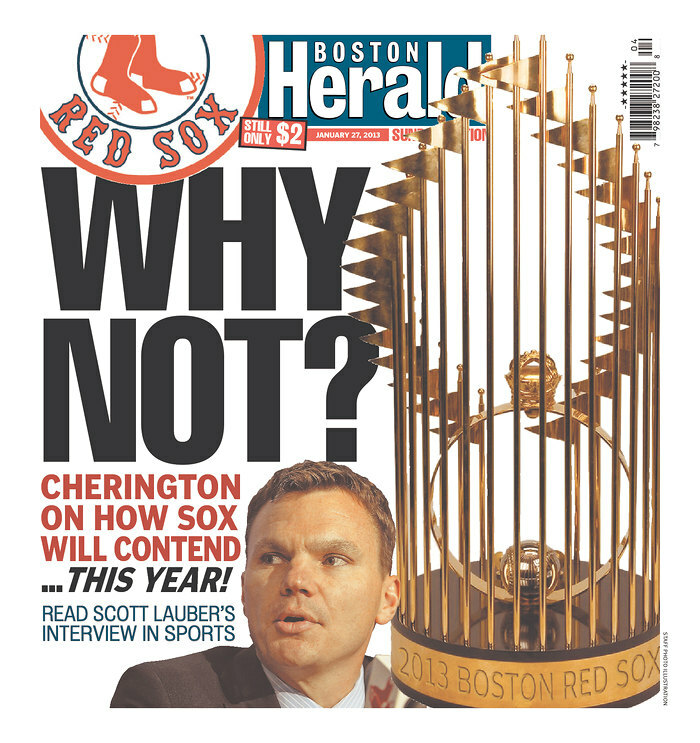 Funny thing, boston.com had the story (via the Huffington Post) yesterday morning, but it didn’t make today’s print edition. Your punchline about respective editorial judgment goes here. The piece in the Sports section has a level of optimism that’s exclusive to pre-spring-training days. Two weeks from today, nearly three dozen Red Sox pitchers and catchers will be in Fort Myers, bracing for their first spring training workout. And shortly thereafter, predictions will begin to roll in. Not even the Mayans would be so bold as to call the Sox a playoff team. A confidence that’s likely exclusive to him, but why get technical about it. Odd approach, yes? Except in Red Sox Nation, of course. Also odd, the ad did not run in the Herald. 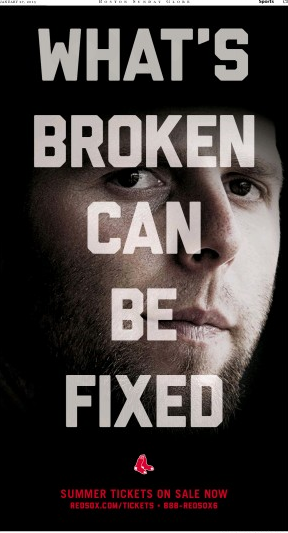 Then again, maybe the Sox figured the Page One promo was enough. You are currently browsing the It's Good to Live in a Two-Daily Town blog archives for January, 2013.